Magnus Anguis Scottianus. Tabula oppugnationis navalis anni 1861, Consilium Anacondae Winfield Scott generalis appellatum. Banshee, cursor obsidionis Confoederatus, anno 1863. A. D. Vance, cursor obsidionis a Classi Unionis captus iterumque nomine Advance (1862) mandata. David, navis Confoederata, impetus in New Ironsides die 5 Octobris 1863 facit, per obsidionem navalem Carolopoli. Proelium Sinus Mobilis. Adumbratio a Ludovico Prang picta. Obsidio navalis in Bello Civili Americano fuit ratio militaris a Civitatibus Foederatis ad Civitates Confoederatas commercio prohibendas effecta. Obsidio a Praeside Abrahamo Lincoln efficacem mense Aprili 1861 redidit, cui opus erat custodire 3500 milium litoris Atlantici et Sinus Mexici, inter quod erant duodecim portus maiores, insignissime Nova Aurelia et Mobile. Multi conatus ad obsidionem eludendam prosperi erant, sed naves satis celeres ut Classem Unionis eludere poterant solum parvam transportabant copiarum partem quibus opus erat. Hae naves, cursores obsessionis appellatae, plerumque a civibus Britanniarum Regni exercebantur, portibus neutrius factionis utentibus, sicut Havana Cubae, Nassavia Insularum Bahamensium, et Bermuda. Unio 500 naves mandavit, quae omne per bellum circa 1500 naves illicitas destruxerunt vel ceperunt. ↑ "Lincoln biography". Americanpresident.org . Anderson, Bern. 1989. By Sea and by River: The Naval History of the Civil War. Novi Eboraci: Da Capo Press. ISBN 978-0-615-17222-4. Browning, Robert M., Jr. 1993. From Cape Charles to Cape Fear: The North Atlantic Blockading Squadron during the Civil War. University of Alabama Press. Browning, Robert M., Jr. 2002. Success is All That Was Expected: The South Atlantic Blockading Squadron during the Civil War. Vasingtoniae: Brassley's. ISBN 1-57488-514-6. Buker, George E. 1993. 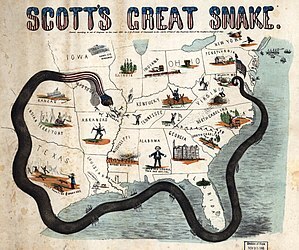 Blockaders, Refugees, and Contrabands: Civil War on Florida's Gulf Coast, 1861–1865. University of Alabama Press. Calore, Paul. 2002. Naval Campaigns of the Civil War. McFarland. Coker, P. C., III. 1987. Charleston's Maritime Heritage, 1670–1865: An Illustrated History. CokerCraft Press. Elekund, R. B., J. D. Jackson, et M. Thornton. 2004. The "Unintended Consequences" of Confederate Trade Legislation. Eastern Economic Journal, p. 123. Fowler, William M. 1990. Under Two Flags: The American Navy in the Civil War. ISBN 0-393-02859-3. Greene, Jack. 1998. 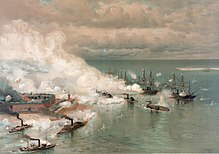 Ironclads at War. Combined Publishing. Surdam, David G. 2001. Northern Naval Superiority and the Economics of the American Civil War. University of South Carolina Press. Time-Life Books. 1983. The Blockade: Runners and Raiders. The Civil War series. Time-Life Books. ISBN 0-8094-4708-8. Tucker, Spencer. 2010. The Civil War Naval Encyclopedia. Vol. 1. ABC-CLIO. ISBN 978-1-59884-338-5. Vandiver, Frank Everson. 1947. Confederate Blockade Running Through Bermuda, 1861–1865: Letters And Cargo Manifests. Wagner, Margaret E., Gary W. Gallagher, et Paul Finkelman, eds. 2002. The Library of Congress Civil War Desk Reference. Novi Eboraci: Simon & Schuster. ISBN 978-1-4391-4884-6. Wise, Stephen R. 1991. Lifeline of the Confederacy: Blockade Running during the Civil War. University of South Carolina Press. ISBN 0-87249-554-X. Wyllie, Arthur. 2007. The Confederate States Navy. Lulu.com. ISBN 978-0-615-17222-4. Wynne, Nick, et Joe Cranshaw. 2011. Florida Civil War Blockades. Carolopoli: History Press. ISBN 978-1-60949-340-0. Novissima mutatio die 27 Maii 2018 hora 19:01 facta.